The priority was visibly evident in the C3PF, with dozens of people working in and around the Starliner that will fly the CFT mission, while only one person was observed monitoring systems for the OFT vehicle. This has to do with the fact that the CFT Starliner has to be shipped to the Boeing Facility in El Segundo for final vibration, pressure and acceptance testing prior to taking humans to space. 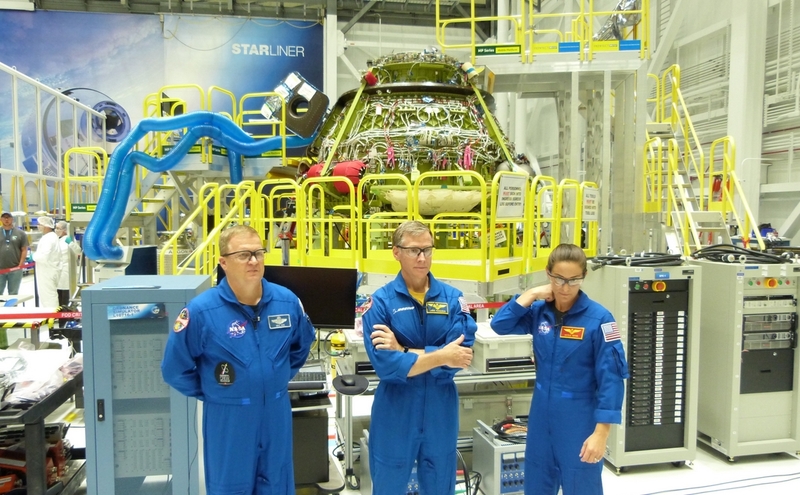 This testing series in El Segundo is a vital part of the certification effort for Starliner and adds extra time to the CFT Starliner’s schedule, time that is not needed for the OFT vehicle which does not have to go through the same procedures prior to its uncrewed test flight that is currently scheduled for either later this year or early next year according to NASA’s Commercial Crew Program schedule. Once the CFT Starliner is completed and shipped to California, work priority in the C3PF (Commercial Crew and Cargo Processing Facility) will shift nearly entirely to the OFT vehicle to prepare it for its mission to test the overall Starliner/Atlas V launch configuration and autonomous controls during launch, docking, undocking, and reentry and landing operations. However, the Starliners themselves and their service modules weren’t the only pieces of hardware on display that Boeing was eager to discuss during the event. 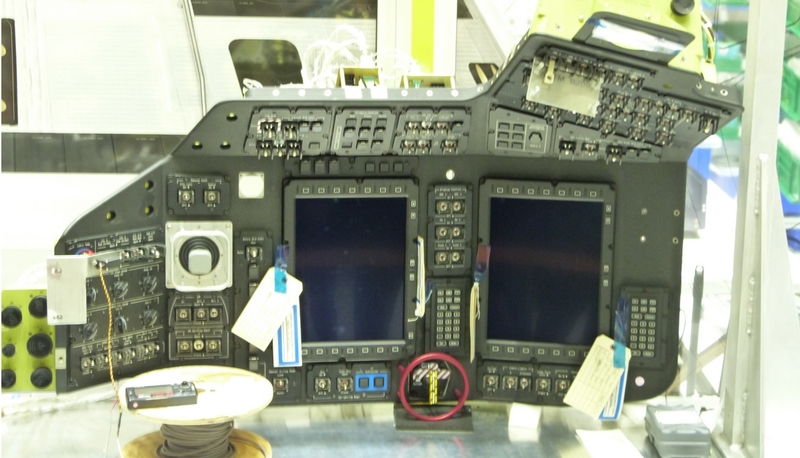 Of note, the company had a mock-up of the control console that will be present within Starliner that one or two astronauts will be capable of interacting with during flights to and from the International Space Station. “The way you interact with the screen is actually, we borrowed a little bit from Orion, and it’s kind of the way some of the 5th generation military planes interact with pilots,” noted Chris Ferguson. But unlike SpaceX’s Crew Dragon which relies on very few physical buttons over touchscreen technology, Starliner will include no such touchscreen tech. “No touch screens,” said Ferguson. “But you can see [there are] a very limited number of switches compared to Shuttle. I think someone counted and there are 40-ish as opposed to the 1,100 that were advertised for Shuttle. “So no touchscreen. We interact in a very Orion-like way. And the switches you do see are really so that if you absolutely have to do something and don’t have time to navigate your way through levels of displays, they’re right there for you,” noted Ferguson. In relation to the Space Shuttle, Ferguson – who flew three Space Shuttle missions as Pilot on STS-115/Atlantis, Commander of STS-126/Endeavour, and Commander of the final Space Shuttle flight, STS-135/Atlantis – stated “It’s going to be a heck of a lot easier to learn how to fly Starliner than Shuttle. “But it is a double edged sword. Even though you need to monitor the autonomy of Starliner, you have to, at the same time, be ready to take over. So you have to be able to understand what it’s doing in order to be able to understand if it’s doing it right. “So I think there’s going to be a pretty steep learning curve, and the initial crews will really have to learn every facet of it. But I’m inclined to think that further down the road it’ll be like Avis Rent-A-Car. You just get in, you don’t have the owner’s manual, and you drive. And that autonomy is something that will be on full display during both the OFT and CFT missions. During OFT, Starliner will fly itself under computer automation up to the International Space Station, with docking expected to occur within 24 hours of launch. This short-duration launch-to-dock timeline will be the normal mode of operation for Starliners when they begin carrying crew. 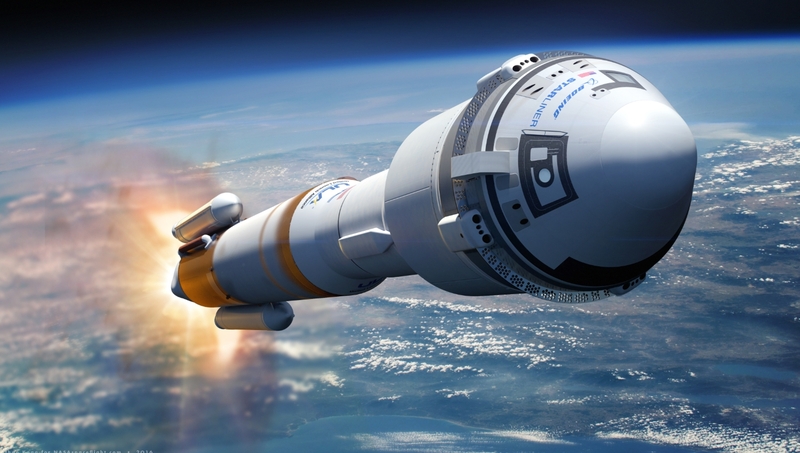 According to Ferguson, Starliner is “supposed to launch and execute a script. And if everything goes right, the astronauts enjoy a ride and smooth docking with the Space Station. But the design also calls for manual override capability of needed. So that’s where we not only put the pilots in manual control, but they can also monitor how the autonomy is progressing according to the script. Is the vehicle doing what it’s supposed to be doing? By definition and per the requirements for the Commercial Crew Program, Starliner is perfectly capable of flying itself without any input from a crew up to the International Space Station and docking itself to the lab. But that doesn’t mean that Boeing’s Starliner team won’t test some of the crew interface designs and capability for the crew to take manual control of Starliner during the CFT mission next year. “By definition, we don’t have to do anything for docking, but when a crew is onboard we have a few belt-and-suspenders operations, I call it a backup camera, so that we absolutely make sure the vehicle is performing as intended,” said Ferguson. Most importantly, the Boeing team sees the light at the end of the tunnel as all the small and constituent components of the program begin to come together. “We’re at the point now where we’re putting the icing on the cake. The cake is baked. This is the point where we now learn how humans work with the vehicles. How do we do basic, simple things. How do we use the restroom facilities, where do we store our trash, where does our food live? More so, between now and launch of the OFT mission, the teams will perform six large rehearsals with their counterparts at United Launch Alliance and NASA on top of the ongoing integrated crew simulations taking place at the Johnson Space Center already. “We’re doing all this so we understand the flow of information between our control team and the booster control team and how the crew gets updates so they know how the vehicle and the booster is performing underneath them for the 11 and a half minute ride to space,” noted Ferguson.